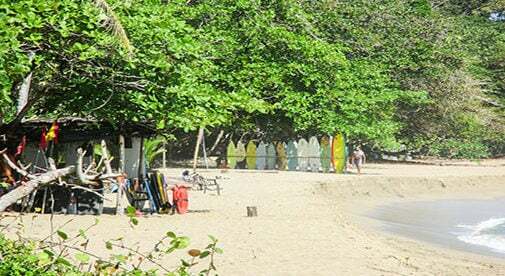 The beach at Puerto Viejo is popular with surfers. I first traveled to Costa Rica seven years ago. Although I began in the capital city, San José, I quickly found my way to the beach towns. When I first found Puerto Viejo, I fell in love with it. This cute, little town is about five hours from San José and a magical place where the jungle meets the beach. Full of wildlife, tropical beaches, and gorgeous sunny days, I knew this was home and was ready to begin a new life in Costa Rica. Life in Costa Rica is very different to life in the U.S. A typical day consists of waking up to the waves crashing or howler monkeys and birds. I usually start my day with drinking some of the best coffee in the world at the local chocolateria, paired with fresh tropical fruit. Costa Rica is where I learned to surf so most days begin with a short bike ride to the beach to hit the waves. Midday usually heats up and this is my time to seek refuge in my apartment or find a local café and work online. My writing jobs are remote and allow me to work from anywhere. All I need is a good WiFi connection, which can be found in Costa Rica. Evenings are for slow, sweet yoga practices and relaxing in the hammock or watching a beautiful pink sunset with a cocktail. To me, this is the definition of Pura Vida. Although I am not in a position to retire just yet, I can definitely see the attraction in retiring to Costa Rica. Life is a bit slower and simpler. Healthcare is pretty affordable. A doctor’s visit is usually around $50 and a specialist visit averaging around $80. My active lifestyle in Costa Rica allows for fewer doctor visits. Being active is part of everyone’s everyday life here. Depending on where you decide to settle, rent is reasonable. You can expect to pay between $500 and $900 a month on the Caribbean coast. The same goes for the cost of groceries. How amazing to find an organic pineapple or avocado for just $1. Although certain appliances or electronics can be expensive (such as cellphones, laptops, juicers, crock pots, etc.) they are pretty easy to find. I do recommend bringing those things you can’t live without from the U.S. to make things easier and save money. I am so fortunate to have found a country that suits me. My lifestyle in the U.S. was much more complex, fast-paced, and stressful. Costa Rica has given me my health back and taught me how easy it is to live simply. Now it’s your turn to sit back, relax, and put your feet up.